Just wanted to add my 2 cents to the EduBlogger Awards http://edublogawards.com/ before time ran out. Grand Finale Machinima Contest – There is still time to help pick the People’s Choice Award! Show us why you are here, your virtual community and place in the Metaverse. Are you in multiple virtual worlds? Show us that too! The perfect three minute machinima. Can you teach something well in three minutes? Show us how you do this. 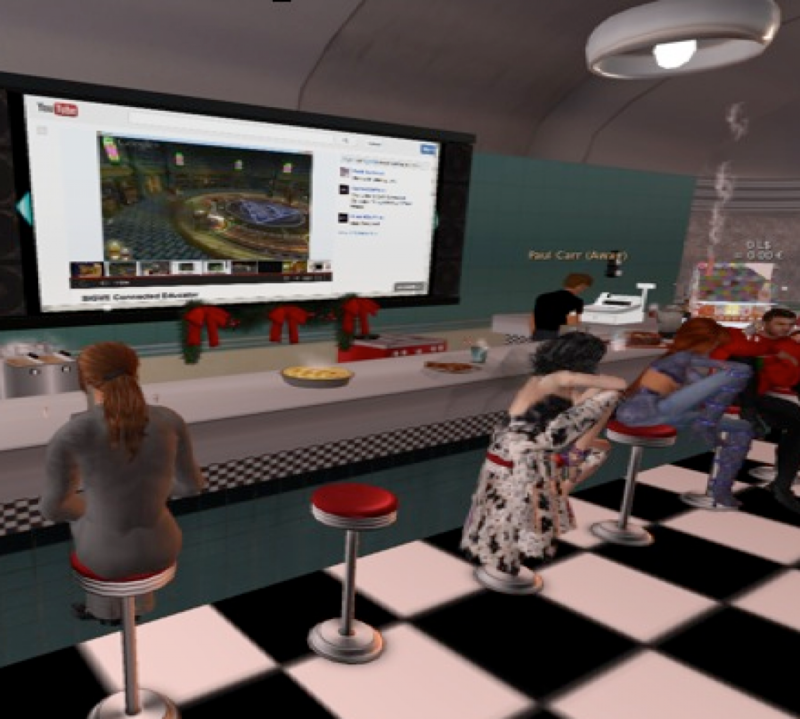 Show us an educational machinima that is currently being used for the F2F, blended or virtual classroom. Show us your best! Open to more than Second Life – give us OpenSim, Halo, WoW, Minecraft! We’re ready for it. Do you have a story? We have an audience. For first time producers who have never made or uploaded a machinima to YouTube before. So be honest (first-timers only) and be brave! Submit your articles about creating or using Machinima! VEJ – Issue 3, Deadline November 20th. Help us get the message out to people about the important educational work that is going on in virtual environments! As many of us talked about last weekend at the VW Unsymposium, now is the time for Trailblazers to help bring in the pioneers and settlers – we need to educate teachers/professors and administrators about the powerful learning that is happening in virtual worlds and most importantly, what is in it (virtual environments) for them (e.g., fun, friends, networking, learning). We would love to get the third issue of VEJ out by December 1st, but we need your help! Please send article of approximately 500 – 1000 words (and pictures if you have them) to me by November 20th. The article should be a word file, 14 point New Times Roman. You can format it – or I will format it. You can put the pictures where you want them – or just send them separtely and I will put them where they fit in the pages – png is prefered, but you can send jpg. We would love to have educational articles from around the world about what you are doing in sl and other virtual worlds. This issue will highlight the VW Graduate Student Unsymposium, so if you were there and have pictures or thoughts, please send those as well. because after all, VEJ is only as good as we all make it! We look forward to your articles and any suggestions you have to make VEJ even better! Last year VWBPE did a Machinima event and an interactive poster competition. This year VWBPE’s program committee wants to see about adding a games event to showcase games designed by students and educators. So this will be a crowd-sourcing, brainstorming type of talk. We are planning on discussing adding a Machinima component to demonstrate the game entry. Friday and Saturday, November 4-5, 2011. The Theme for 2011 is Games, Play and Community. This is a fully online, free conference. The Virtual Worlds Graduate UnSymposium is a community building event that provides opportunities for graduate students, alumni and educators to share current practices, network with colleagues, and explore opportunities for professional development, enhancing research, teaching and learning. Has everyone read this article ? It’s saying what we know but…. we need to continue learning, creating, showcasing and discussing. Machinima is the outreach and product that we do in games and virtual worlds. We are planning on continuing our discussion at VWGUS. The Virtual Worlds Best Practices Call for Proposals just went out and Machinima was included. Machinima produced by educators, researchers, and students will be accepted in the categories listed below. Videos should be saved with the high definition resolution of 1280 x 720p and uploaded to YouTube. The video YouTube URL should be included in the submission to http://conf.vwbpe.org. All submissions should include a credit section at the end of the video. Please provide attribution for public domain and Creative Commons material. Name the author and others who have contributed to the video. Year of production of the machinima film does not matter. Submitted works do not need to be pure (100%) machinima, but should contain be at least 80% machinima. Non- English language films should be submitted with English sub-titles. By submitting this video to the conference, I understand I am granting VWBPE a non-exclusive, worldwide, royalty-free right to use, reproduce, capture still images from, display, transmit, stream, and broadcast my submission in association with and during the VWBPE conference from the submission date and thereafter unless otherwise revoked in writing by me. A submission on http://conf.vwbpe.org/ site must be completed for each film being submitted to the conference. Educators, researchers, and students may submit as many of their own films as they wish.